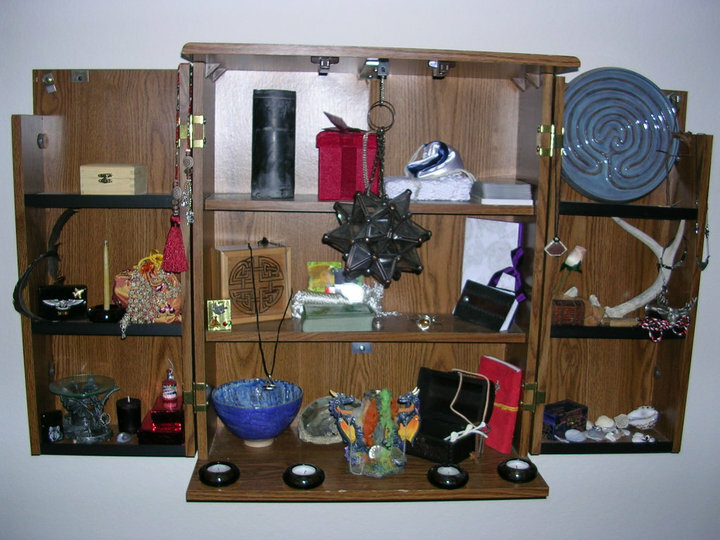 Where the original altar was all one cohesive, albeit generic, altar – whose original point was to have something of both of us melded together into one, the secondary altar, the one on the dresser, is coming together as 1 place, but altars to multiple deities/figures. I don’t know why, I haven’t examined it in too much detail. I’ve simply been unpacking boxes and putting things where they seemed to need to go. Rebuilding the altars at this point is an exercise for my mind…a way of starting to reconnect with the gods that I thought had given up on me since my detour into places they didn’t want me to go. I need to go out and get journals soon. During a rather impromptu meditation session last night, letters and thoughts slipped through my mind, things that are clamoring inside of me that need to be written – but that aren’t necessarily for public consumption. In part inspired, I’m assuming, by a podcast I listened to on Loki yesterday, one of the thoughts was a need to compose my thoughts on him, to finally address why every time he has shown up in my life I have shown him the door. I think it is time to address that fear/anxiety. The altar as it was originally set up. I had once asked my partner, in a fit of insecurity about the status of our relationship, to marry me. He promptly said no. My response, since he still insisted that his home was my home regardless of the status of our relationship and what we called it, was to create this altar – some of his life, some of mine, all blended together. He added his own touches to it as well. That was almost 3 years ago. It is now time for the altar to morph into something new, it is time to honor the gods the way I should be.